New coming! Vaporesso Luxe Nano Kit with SKRR-S Mini Tank is powerful and portable. The Luxe Nano Mod features the most rapid, stable yet safe firing rate of 0.001s, bringing you denser clouds and flavorful taste within the very first puff. Equipped with the sleek edge-to-edge 1.3inch TFT screen, it fits comfortably in the palm of your hand. Vibration-enable buttons provide high-tech hand feeling. Driven by the OMNI Board 4.0 chip, the mod supports super player mode (0.03-5ohm) and multiple protections. The Luxe Nano is powered by 2500mAh built-in battery, supporting 80W max output. It also features 2A quick charging function. The SKRR-S Mini Tank with 3.5ml capacity adopts top fill system and leakproof design. It is compatible with QF Meshed coil & QF strip coil, delivering rich flavor and longer lifespan. How to charge Luxe Nano? Simply charge Luxe Nano Mod by connecting it with a computer, a power bank, a wall adapter or other electronic devices (with a USB port that is capable of providing a charge) via USB cable, also you can purchase an inexpensive USB car adapter, thereby affording you the ability to charge the Luxe Nano Mod in the car. This is particularly useful while you are on long drives and road trips. ❤ Please read the user manual carefully before using this Vaporesso Luxe Nano Kit. 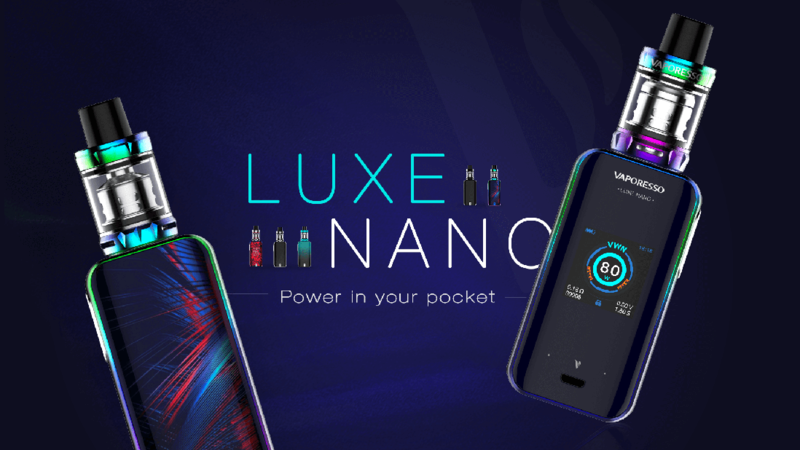 ☞ 6 months warranty period for Vaporesso Luxe Nano Kit.